‘Effortless beauty’ is the mantra of Aerin, an off-shot lifestyle brand from cosmetics power-house Estee Lauder. Aerin is aimed at women who strive to balance their busy lifestyles with a touch of indulgence. Feminine shades combine with a signature rose scent to make this collection the epitome of elegance. If, like us, you are a sucker for pretty packaging, you will love this year’s Spring Color collection. Utilising all the soft ballerina inspired shades of the SS13 runways, Spring Color is bang on trend and stunning both on and off. 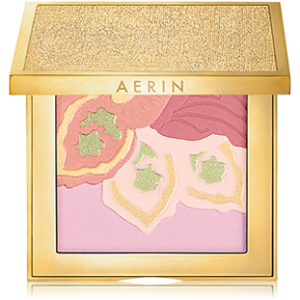 The collection’s centrepiece is undoubtedly Aerin’s Floral Illuminating Powder, inspired (according to the website) by: ‘The bright, fresh possibility of an idyllic Spring morning’. The powder compact is pressed with a beautiful flower motif in five pastel shades. These can be blended with a fat brush to brighten any complexion with a subtle radiance. Encased in luxury gold and smelling of roses, this £45 compact is the perfect accompaniment to warmer weather and the promise of a new season. If you love classic designs, you’ll love Aerin Spring lipsticks. Free from tacky motifs or chunky encasing, these lipsticks are the concords of the cosmetics world – sleek, simple and the epitome of luxury. The rich, creamy formulas are scented with rose and the three new shades are endlessly wearable. ‘Garden Path’ – burnished pink. If you’re looking for something to brighten up the bleak February mornings, head over to Aerin and treat yourself to a few pieces from the new Spring Colour collection today.